The Wort Report: Thank you, come again! In a staggering display of marketing genius, 7-Eleven plans to convert 11 of its stores to real-life Kwik-E-Marts for the release of The Simpsons Movie this summer. According to The Richmond Times Dispatch, the chain will also be selling Simpsons-themed products such as Krusty-O's, Squishees and Buzz Cola. I'd ask if they were selling that beer with the candy floating inside, you know, Skittlebrau, but much to Homer Simpson's dismay, no such product exists. He'll just have to go with a six-pack and a bag of Skittles. This brings me to an interesting point. Marketing for movies has become overwhelmingly crass, yet at the same time it's made all the more entertaining by stunts such as this. Remember Snakes on a Plane? Well, you probably didn't see the movie, but I bet the Internet marketing of that flick still sticks with you to this day. We're just not tired of motherf*ckin' marketing in our motherf*ckin' faces. Oh yes, I went there. 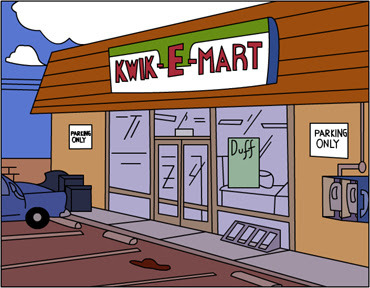 I welcome this promotional tactic, although with only 11 planned conversions to Kwik-E-Marts taking place, there probably won't be a location near me participating in the craziness. Until then, I'll just have to sit and dream of chutney Squishees (you can really taste the chutney! ), after-dinner burritos (Strawburritos) and delicious creamed eels.